Recent literature on intrinsic value contains a number of disputes about the nature of the concept. On the one hand, there are those who think states of affairs, such as states of pleasure or desire satisfaction, are the bearers of intrinsic value (“Mooreans”); on the other hand, there are those who think concrete objects, like people, are intrinsically valuable (“Kantians”). The contention of this paper is that there is not a single concept of intrinsic value about which Mooreans and Kantians have disagreed, but rather two distinct concepts. I state a number of principles about intrinsic value that have typically (though not universally) been held by Mooreans, all of which are typically denied by Kantians. 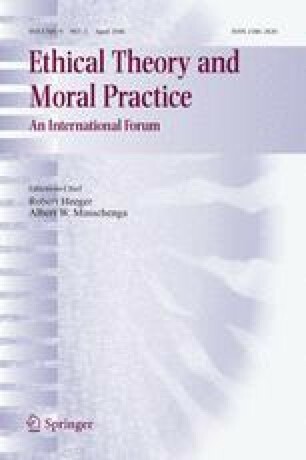 I show that there are distinct theoretical roles for a concept of intrinsic value to play in a moral framework. When we notice these distinct theoretical roles, we should realize that there is room for two distinct concepts of intrinsic value within a single moral framework: one that accords with some or all of the Moorean principles, and one that does not.